Got 5 minutes? Whip up these delicious coconut latte vegan overnight oats for an easy, fiber-filled breakfast that are oh-so-delish! 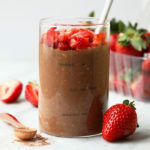 This overnight oatmeal recipe only requires 5 simple and healthy ingredients to make and this breakfast that will have you full all morning long. What’s better than a big bowl of oatmeal and a latte? NOTHING. 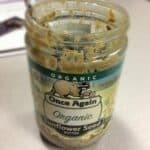 I am deeply in love with this Vegan Coconut Latte Overnight Oatmeal recipe. It’s made with 5 total ingredients that are all gluten-free and good for you! 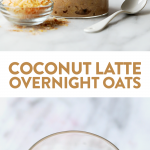 There are two secret ingredients in this overnight oat recipe that makes it a coconut latte: 1. coconut milk and 2. brewed coffee! Mix the two together and you get a coconut latte. Get in my belly. We topped our oats with some coconut whipped cream. We love THIS recipe by Minimalist Baker, but you can also make a simpler and healthier coconut whip cream by whipping the solid part of full-fat coconut milk with some maple syrup. 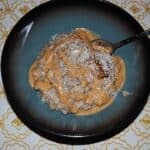 Top with more coconut cream, shredded toasted coconut, and cinnamon. Enjoy! This recipe was originally published on 4/2/2015 and was revised on 4/12/2018. I’m sure you’re dying to know fact #5. Fact #5: I have depression. Not sure why I’ve never talked about this topic on FFF but…I have depression! Why do I say it with such excitement? Well- I’ve got it under control and I really don’t let it define me. Way back when during my ED days, I was diagnosed with depression and anxiety. Depression is a mental illness and as you know, can be difficult to control. Eating disorders + depression + anxiety all sort of go hand in hand became one GIANT mental illness. I get a lot of questions on how I recovered from my eating disorder and while a lot of it was due to changes in my lifestyle…I am also on an antidepressant, which has helped monitor my hormone levels. I’m not going to lie, taking that first pill was one of the scariest days of my life. I remember sitting in my room holding the bottle in my hand just bawling. I didn’t want to be that crazy person who had to rely on drugs her whole life. Well people, I got over that quickly because they really did help bring my anxiety level down and chill me the eff out.